Prideaux writes about how Munch was affected by spiritualism and use of developing camera technology. In his photography, Munch experimented with the exposure and other processes to achieve supernatural effects that suggested “spirit images” and dopplegängers. Even paintings like “Madonna” (above) were influenced by photographs that claimed to capture the aura emitted by all living beings. Read more to learn about Edvard Munch’s unique vision and how the arts of looking and painting in the Modernist period were changed by that period’s new technology. This is really interesting to read about, especially about how advances in technology at the time allowed Munch to capture spirituality in different ways! I like the reminder that new technologies continuously lead to improvements not just in the sciences, but also in how we experience and connect with works of art on an emotional, human level. Maggie- I like your point about technology connecting on a human level. That’s exactly what I picked up on, too. I also was really interested to see the connection of Munch’s photography and painting. Even across different mediums, his exploration stays the same! I see how Munch was thinking in terms of the effect photography had on a subject while he was painting this piece. The emphasis placed on the woman’s face is similar to how a photographed subject can be in focus in certain areas and out of focus in others. The emphasis placed on her face captures her emotion and thus her humanistic qualities. I really enjoy the vibe of this piece! This makes me think of the Renaissance ideology that paintings and artworks had their own kind of “spirit” to them. In one of my classes, we learned that people actually believed that paintings and other art objects actually had lives of their own at night when no one was watching; many people believed that art objects would be found in mysterious places due to their nighttime activities. 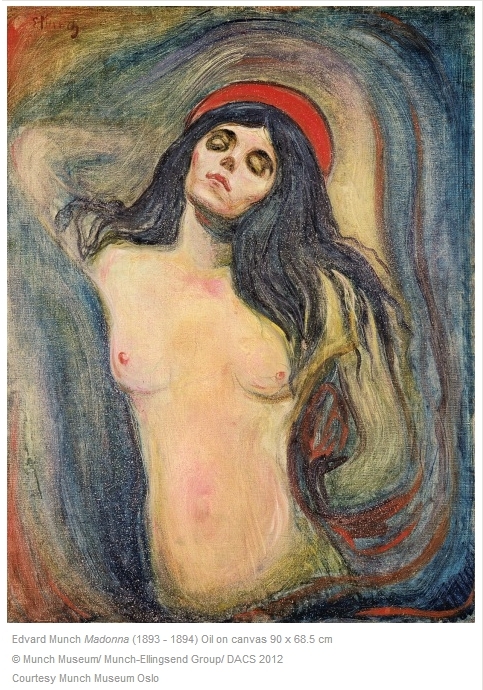 Similar to this, it seems as though Munch believed that the human body had its own distinctive aura. Adrienne, I was thinking the exact same thing – the flattened body, the sharp edges of the outline, and the stark contrast between background and foreground all appear to come from photography. It reminds me of Manet’s Olympia, in a way.